Here are another batch of mini reviews of the X-Box Indie channels dodgy zombie games. You know, I kinda liked this game, it is at least different from the usual zombie games. Your Sister has headed off to Spring Break just before a zombie outbreak, so getting in your camper van you drive off to rescue her. The game takes place on a single long straight road. 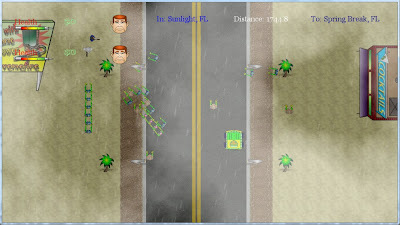 You drive and drive and drive, occasionally you come across a survivor in the middle of the road where you are forced to vacate your car and help him survive a wave of non animated zombies (who it must be said completely ignore the survivor you are supposed to be protecting), After beating them you get back in your van and drive periless for another couple of hundred metres. During my travel on the long never ending road I did happen across hostile bandits as well. First impressions were good for this game, it has shopping centre style remixed Christmas tunes playing, while everything looks like they are made out of wooden blocks. 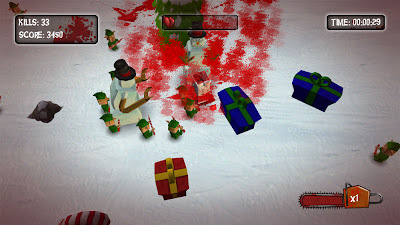 You play as Santa armed with a chainsaw who must defeat waves of infected enemies in an arena. For the main part you are being assaulted by elves, but exploding Turkey's, and giant robot snowmen also appear. My problem with this is that first your chainsaw only makes noise if you are killing something so there is not much feedback there. Secondly the collision detection is patchy at best. You have to walk into enemies to kill them but sometimes, randomly you instead take damage for doing so which is quite annoying. So all style over substance, not very good. In Zombie Attack! 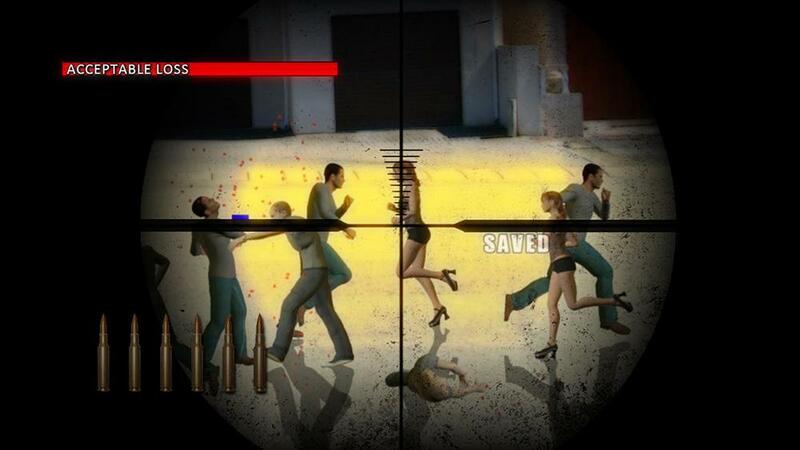 you play as a Police sniper who has been charged with protecting a (very) small area of a City from zombie attack. Humans run around while identical grey shirted zombies walk back and forth occasionally biting the panicked humans. The game takes place through the dirty gun sight of your rifle. Was ok I guess, the zombies look awful, and I swear one time when a female human got turned into a zombie she immediately changed into a grey shirted male zombie which is a bit poor. Really not much to the game, a tad boring. Yet another overhead twin stick shooting zombie arena game. 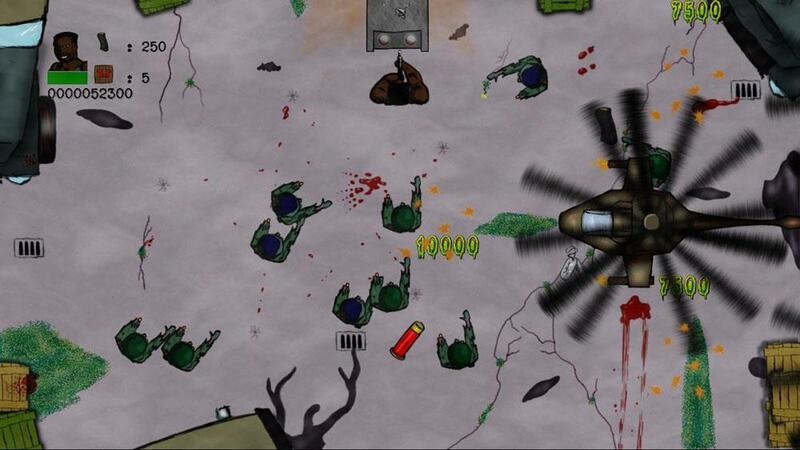 You play as a soldier who must survive against waves of identical looking zombies. They spawn into the area, and when they are killed they just vanish. Your gun does not need reloading so it is not like there is even any tension there. Bland and boring. Gone are the days when I will dedicate a full review to these type of things. 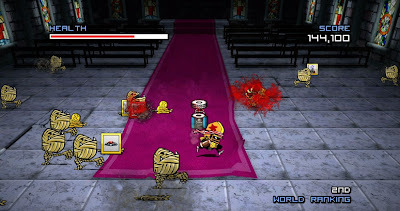 This game looks fantastic, like Castle Crashers it is really bright and colourful. You play as a creature wearing an American Football outfit, and armed with an American football for a weapon. Each 'Quarter' sees you fighting off waves of enemies. Despite the title I didn't actually see any zombies, instead I fought eyeballs, robots, fish, golems, and demons. As you have just the one football you have to wait for it to return giving it some strategy. Not bad at all. Another chunk of Indie games reviewed, but don't worry there are many more indie zombie games to review!